Title: 10/06/1995 - MSDSs for chemicals purchased prior to 1985. This letter is in response to your request for an interpretation pertaining to material safety data sheets (MSDSs) for chemicals purchased prior to 1985. 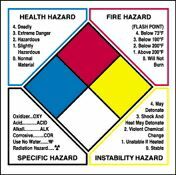 The Hazard Communication Standard, 29 CFR 1910.1200, became a final rule for manufacturing facilities on November 25, 1983. That standard mandated each employer to obtain and maintain copies of MSDSs for each hazardous chemical used in the facility. Although the use and availability of MSDSs were fairly widespread in the chemical industry prior to 1983, there was no regulatory standard. At that time MSDSs were required under the Occupational Safety and Health Administration (OSHA) standards in the maritime industry (29 CFR Parts 1915, 1916, and 1917). Some state right-to-know laws also required the availability of MSDSs, but most of the data sheets were generated as a good business practice rather than as a response to legal requirements. Properly completed MSDSs serve as excellent, concise sources of information regarding the hazard of the chemical. In the preamble to the proposed rule (F.R. Vol. 46, No. 11, page 4436), as in the preamble to the final rule (F.R. Vol. 48, No. 228 pages 53305 - 53306) OSHA recognizes the fact that some employers voluntarily maintained copies of MSDSs prior to 1983. 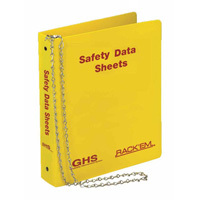 OSHA also stressed the utility of the data sheets and the importance of making those data sheets available to employees. "Where available, copies of material safety data sheets (MSDSs) for hazardous substances and mixtures be given to workers and their representatives upon request." "The proposed standard would provide material safety data sheets (if they exist) to workers upon requests." "The fact that some employers do not voluntarily provide MSDSs, or that when provided the sheets may not contain thorough information, does not detract from the utility of an MSDS ... when it contains the necessary information and is readily available to employees ..."
Get your MSDS binders, posters, signs and more at Safety Emporium. Manufacturing employers were not legally required to obtain, maintain, and make available upon request copies of MSDSs until May 26, 1986, (the effective date of the final rule). Thus, the employer is under no legal obligation to do so for hazardous chemicals purchased prior to 1985. However, if MSDSs were voluntarily obtained and maintained, it is good business and industrial hygiene practice to make those data sheets available to employees in light of OSHA's definition of "exposure records." OSHA standard 29 CFR 1910.1020, Access to Employee Exposure and Medical Records defines "employee exposure records" to include MSDSs. We hope this information will be of assistance to you. If you should have any further questions please feel free to contact OSHA's Office of Health Compliance Assistance, MaryAnn Garrahan at (202) 219-8036. Recently questions arose over a laboratory's obligations under the law to provide MSDSs for chemicals which were purchased prior to 1985 and of those which are no longer sold, handled and/or supported by the original manufacturers. I spoke to OSHA Industrial Hygienist Rich Fairfax from your office, and he relayed the information that a filed letter or documented phone call would suffice if documentation indicated that the chemical is no longer sold, handled and/or supported by that particular manufacturer. I ask him for the chapter and verse in the law, and he said that his answer was an interpretation of the law. Rich suggested that I write to you, in order to obtain an official letter documenting this interpretation. Please send a letter or documents confirming his interpretation. Thank you in advance for your time and effort.